A novelist who specialized in military fiction says his wife was killed in a fall down the stairs. Prosecutors plan to argue he killed her for financial gain and tried to pass off her death as an accident. 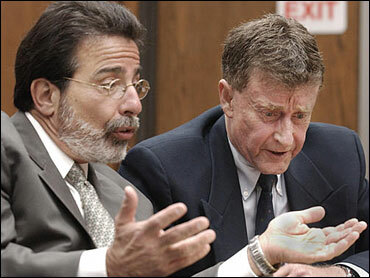 Opening arguments begin Tuesday in the first-degree murder case against Michael Peterson, 59. He is accused of killing his wife, Kathleen Peterson, inside their luxurious home in Durham on December 9, 2001. Peterson contends his wife died after accidentally falling down a staircase, where he found her. Prosecutors cite bruises and cuts, including a 3-inch gash on the back of her head, as evidence she was killed. "No one will agree on anything," predicted Peterson's lawyer, David Rudolf. The trial is expected to last two or three months. If convicted, Peterson could get life in prison without parole. Peterson earned a Silver Star for bravery for leading fellow Marines in 1969 in an all-night battle to defend a remote outpost from North Vietnamese Army troops. He later turned his experience into a writing career, and sold the movie rights to one of his books weeks before his wife's death. Peterson's novels include the 1990 book "A Time of War," an in-the-trenches look at the Vietnam War, and a 1995 sequel, "A Bitter Peace." In addition to being a novelist, Peterson is a former columnist for the Durham Herald-Sun and a former candidate for both mayor of Durham and the city council. Prosecutors said Peterson killed his wife because he feared she would lose her $145,000-a-year job as an executive with a struggling telecommunications company, and because he wanted the couple's assets for himself. "I do not get involved in a case, especially a case that is so high profile, that I don't believe strongly in the evidence and our ability to prove the case," said District Attorney Jim Hardin. Prosecutor David Saacks notes that financial worries are "among the oldest, if not the oldest, motive" for murder. Speaking for the defense, Rudolf argues that the Petersons were wealthy and a financial motive makes no sense. If the judge allows it, prosecutors plan to introduce evidence related to the 1985 death of a close friend of Peterson's who was found dead at the bottom of a staircase in her home. Prosecutors have said Elizabeth Ratliff's death is a critical part of their case against Peterson because of the similarities in the two deaths. Ratliff lived near Peterson and his first wife in Germany in the 1980s; Peterson was one of the last people to see Ratliff alive. German officials concluded Ratliff died after an apparent stroke, and a criminal investigation was never conducted. However, when Ratliff's remains, buried in Texas, were exhumed and autopsied two months ago, medical examiners said she died from "blunt force trauma to the head" from a "homicidal assault." German authorities have reopened their investigation.